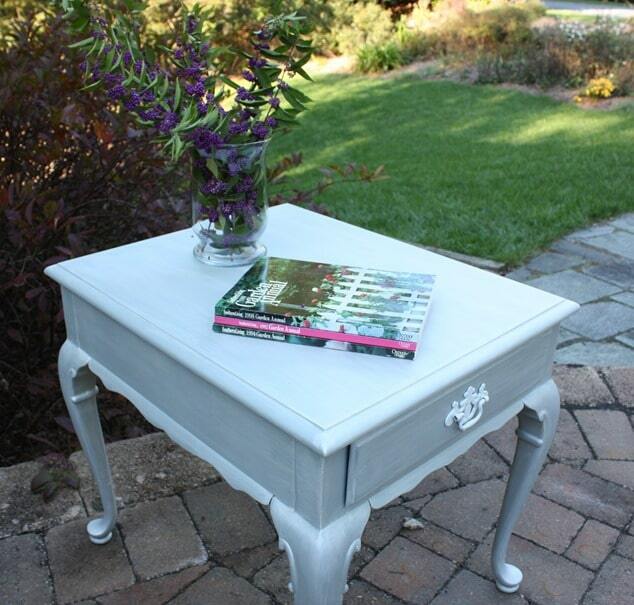 At a yard sale in one of the prettiest spots in Bedford County (see it here), I purchased this Stanley end table. When I saw it, I knew that it would be a great candidate for a Glitz and Glamour makeover. This table was in great shape and just needed a good cleaning and sanding before its makeover could take place. Since it is a dark color and I knew that I wanted to paint it a light color, I was worried that the dark color would bleed though the light paint. 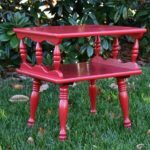 To avoid this, I started the makeover by giving the end table a coat of polyurethane. I then painted it with two coats of Grey Silk from The Plaster Paint Company. 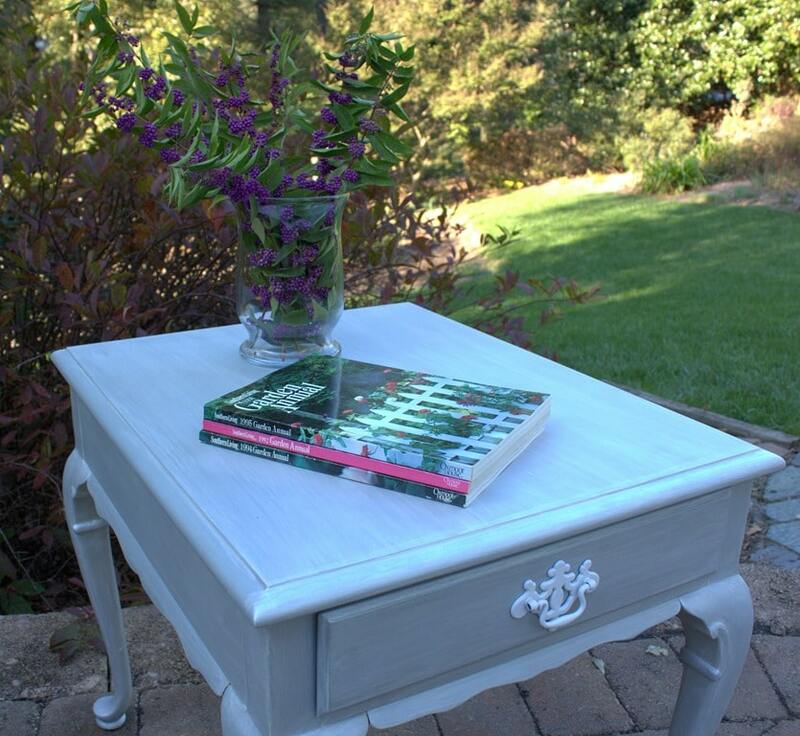 To add some glitz and glamour to this table, the grey paint was given two coats of Pearl Metallic, also from The Plaster Paint Company. To protect the finish, I sealed this piece with Americana DuraClear Ultra Matte Polyurethane. The beautiful pearl metallic paint finish was difficult to capture in my pictures. In this shot you can get a glimpse of the pretty pearl metallic sheen. 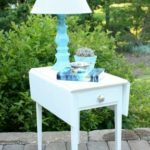 I used the original hardware and gave it an update with a few coats of white spray paint from Lowes. I really like the look of the metallic paint over a solid base coat of grey. 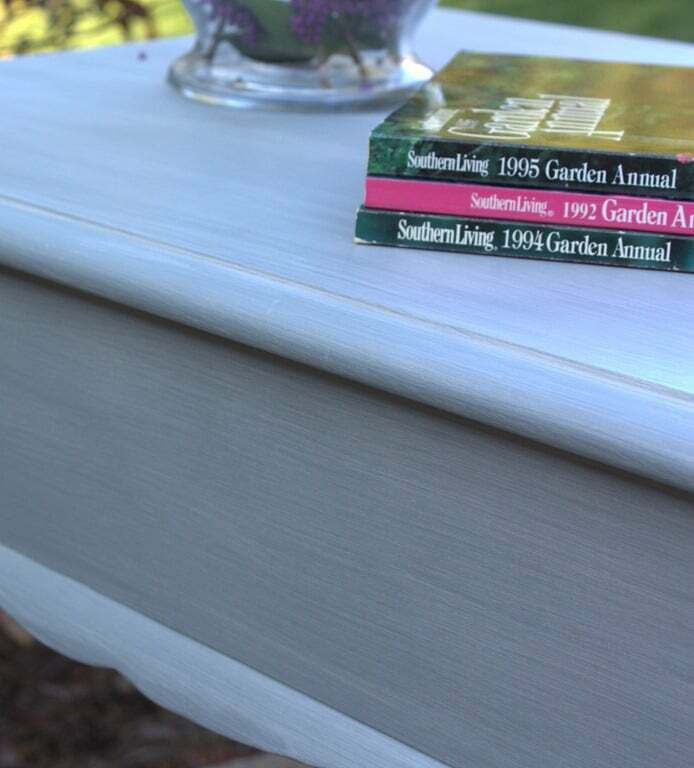 In the 1990’s Southern Living published not only an annual cookbook but also a garden annual. I so much enjoyed this publication and still refer back to these books. 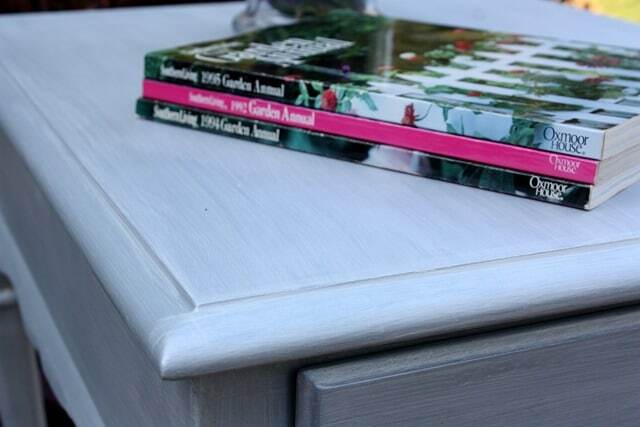 Unlike decorating, garden information doesn’t get dated quickly. 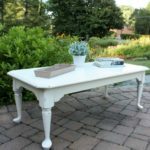 I can picture this table finding a home in a young woman’s apartment to be used as an end table or a bedside table. 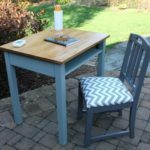 If you are local, this table will be for sale at the Picket Fences Vintage and Antique Pop Up Event being held at Millstone Mercantile in Madison Heights from 9 am – 2 pm on October 22. 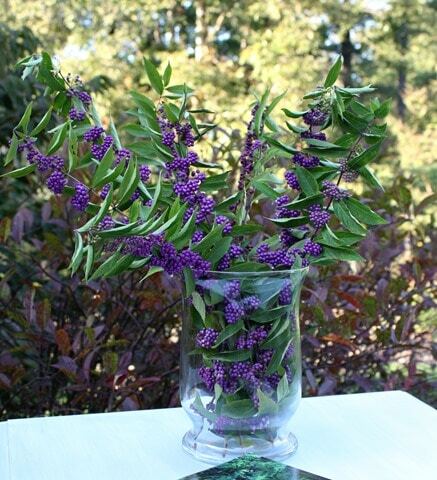 I don’t usually cut branches of Beautyberry to bring into the house because I assumed that the berries would quickly fall off the branches and make a big mess. This bunch has been on my kitchen table for several days and hasn’t shed at all. I’m glad to know that I can now enjoy my Beautyberry both outdoors and indoors. If you like this project, please pin it for others to discover. I’ve got something exciting to share with you! 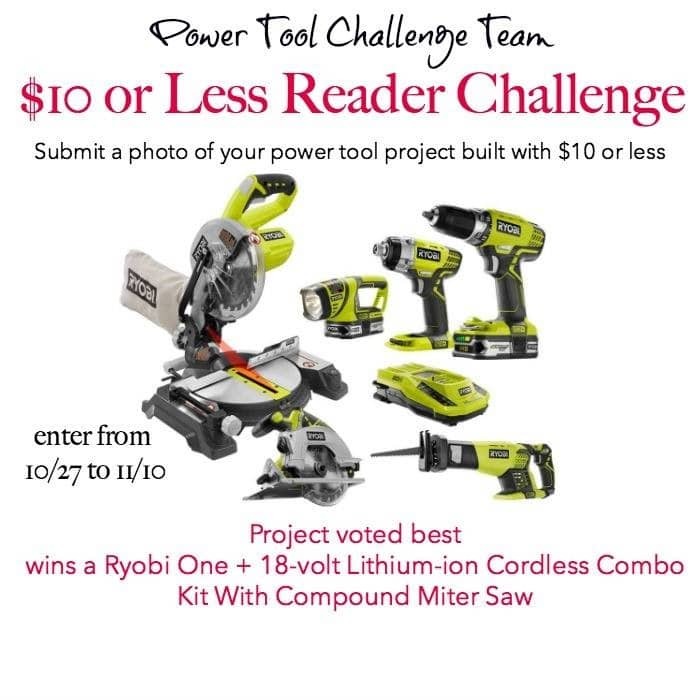 On October 27 my Power Tool Challenge Team girls are sharing $10 projects and we are having a contest where one winner will receive the tools pictured below. All you have to do is submit a project made using a power tool that cost $10 or less. And you don’t have to have a blog to enter! 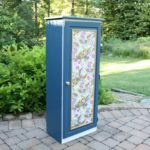 Think about a project that you or a family member has made, snap a picture, and enter between October 27 and November 10. I’m really looking forward to this event! 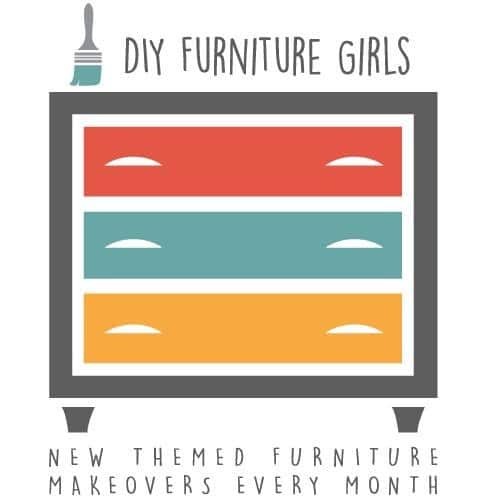 I can’t wait to see what my DIY Furniture Girls share this month for our Glitz and Glamour theme. 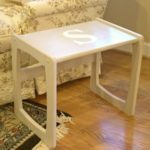 Scroll down to find links to each project. Very nice finish Paula! So elegant and classy! What a difference! Thanks, Lindsay! I’m really pleased with how it turned out and I hope to find a home for it very soon. Paula, that turned out Beautiful! Love the sheen on it! Thanks, Karin! I’m really pleased with the end result. Beautiful makeover! The metallic paint looks fantastic. Thanks, Amy! It looks better in person. The metallic paint gave me a fit when I took pictures. Love this Paula! I can just see the pearly sheen of the finish. You’re right, that table is perfect for it 🙂 Pinned! 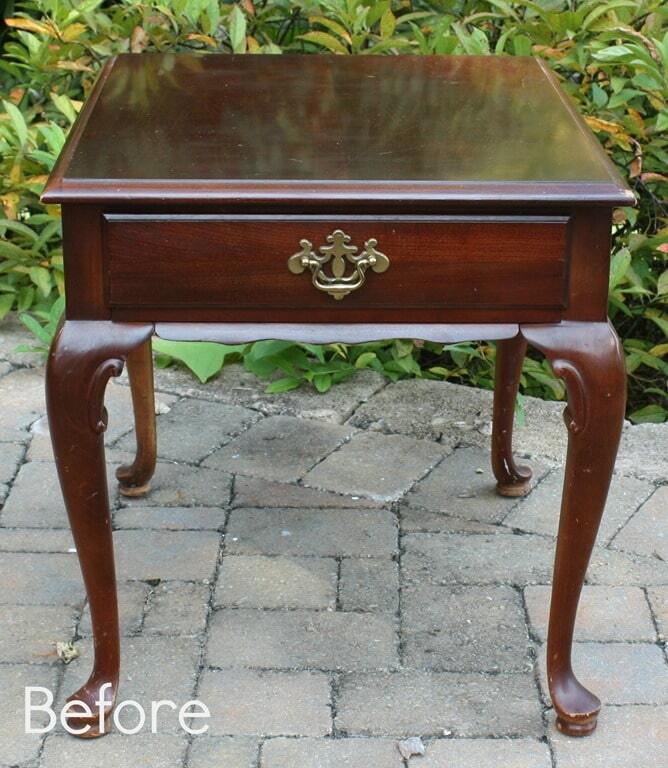 This is a beautiful sweet makeover! 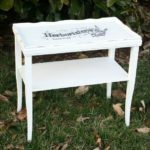 Yes, perfect for some young ladies end table or nightstand! 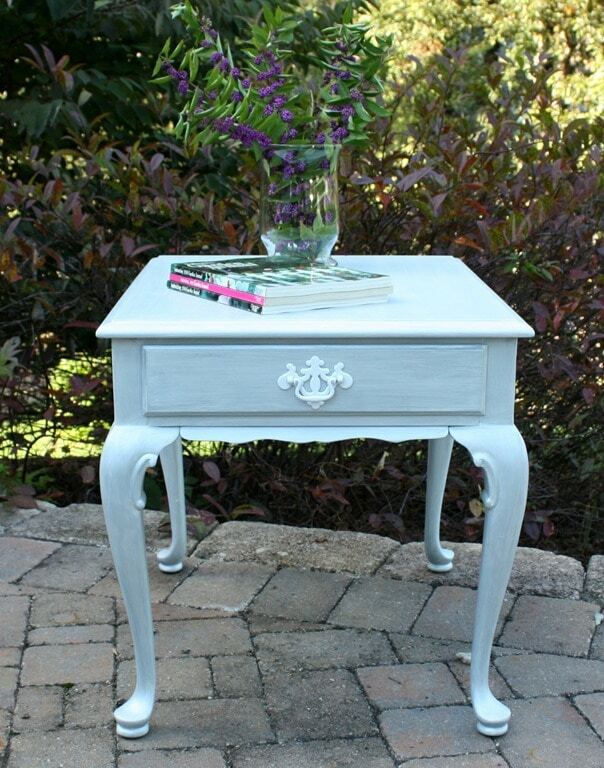 Love the pearly sheen finish! Thanks, Kim! I’m hoping to find a home for this piece very soon! 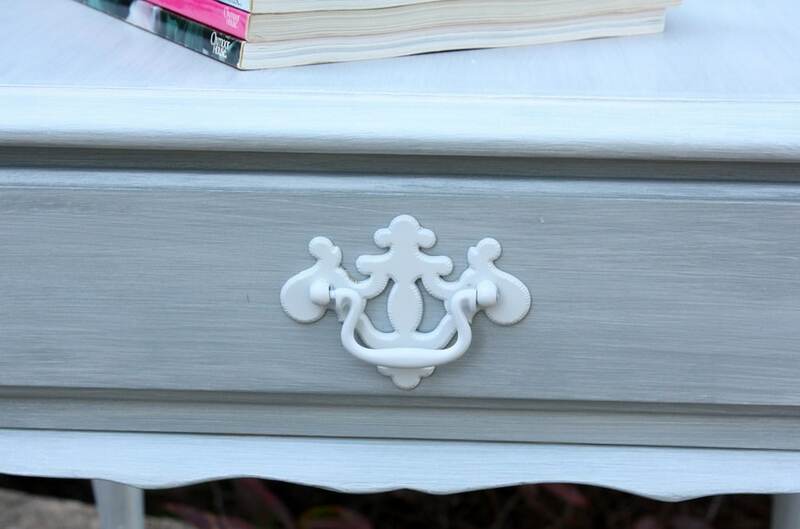 This is lovely and I adore the color you picked out. I enjoyed stopping by and hope you have a great week. 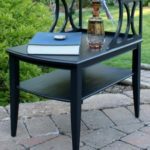 This little table looks so glamorous in metallic! Hope you have an awesome time at the market, Paula! Thanks, Jen! There’s another event going on nearby where the market is being held and I’m hoping that it will draw some traffic to us. I hope so, Christy. I’m doing a market tomorrow and I’d be tickled pink if someone buys it. Beautiful makeover Paula! I adore that pretty sheen it has now! This came out great! I love how it is a little glam! Such a pretty color too! 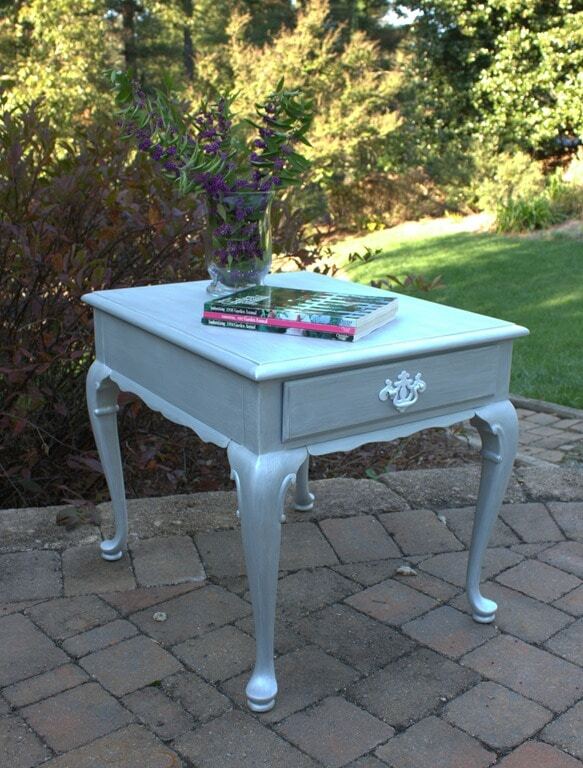 The metallic paint looks really good on the end table. I love the makeover. Thanks for linking up at the #HomeMattersParty. Hope to see you at this week’s party, the door is open Friday at midnight EST.